New York : Franklin Watts, Inc. 1996. 100 ME:PersonalName 0 $a Personal name Williams, Jean Kinney. 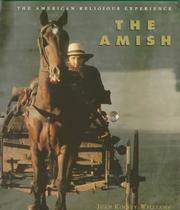 245 Title 14 $a Title The Amish. $b Name of publisher, dist, etc Franklin Watts, Inc.
300 Physical Desc $a Extent 111 p.
700 AE:PersName 0 $a Personal name Series: American religious experience.